Questions or concerns? Please contact Suzanne Lindt (817-233-7584). Run a fun race with showers of color powder! 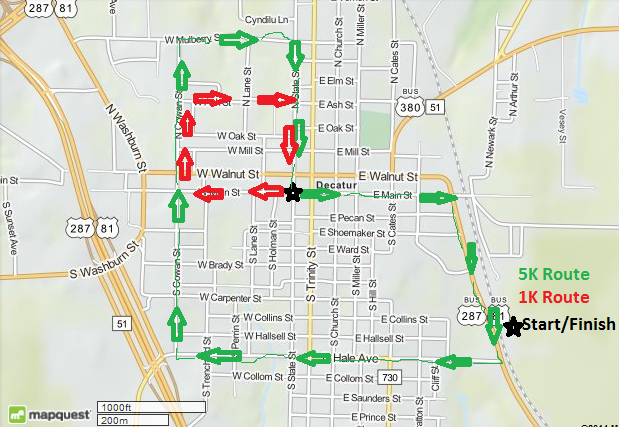 5K : Start at the Courthouse where you will follow East Main Street, down Business 287/81, west across Hale Avenue and then up Cowan Street where you intersect Mulberry Street to an exciting finish down State Street back to the Courthouse. The 1K Kids Fun Run also starts at the Courthouse at State Street and Main Street, where you will follow until it turns at Cowan Street, then go East across Ash Street and finish up past the Courthouse on State Street. ONLINE REGISTRATION ENDS on September 4 at 11:59 PM. Awards are awarded three deep in each age group. Participation ribbons will be given out to all Fun Run participants.